Dedicated to vibrant health for Central Oregonians for over 25 years. Clients say that Dr. Rosen is an MD who really cares. His unique blend of medical expertise is valued because it works, but his compassion for his clients is what stands out the most. We welcome you to our practice and hope that vibrant health is just around the corner! Download your patient intake form. Dr. Rosen and his staff aspire to give you the time and attention you need to feel great about your health care and help you recommit to your personal wellness. We want you to thrive, not just survive. I have been practicing Medicine for 30 years now. It was very exciting to find that there was more to it than what I learned in medical school. I enjoy learning more about the different healing modalities available, it is a stimulating part of my life. I love spending time with my wife and twin daughters, being out in nature, practicing Yoga and traveling. I have had many jobs over the years, but by far my absolute favorite and most gratifying has been working these past almost 20 years for Dr. Rosen. I answer phones, schedule appointments, work with supplements, and assist with patient needs. Being of service is extremely important and enjoyable to me. I marvel at the amazing help I have seen Dr. Rosen give others over the years and love playing a small role as part of the supporting team to peoples wellness. In my spare time I have enjoyed hospice work of singing to the dying, Taize Choir, yoga, iconography, gardening, reading, travel, movies, cooking, massages, and time with our daughter & son. I love people, animals, nature, mountains, rivers, kindness, and silence. Wilderness makes me whole. My name is Missi Baldwin, and I am a registered nurse that works in the back office for Dr. Ron Rosen. I have been here 5 years. I give all the infusion (IV) medications for Ron’s patients in our community room. It’s a unique area of positive energy for sharing and caring of each individual. When I am not at work, I love to hunt and fish, garden and cook, float on the Deschutes River, snowshoe or do most anything else that takes me outdoors to enjoy Central Oregon. 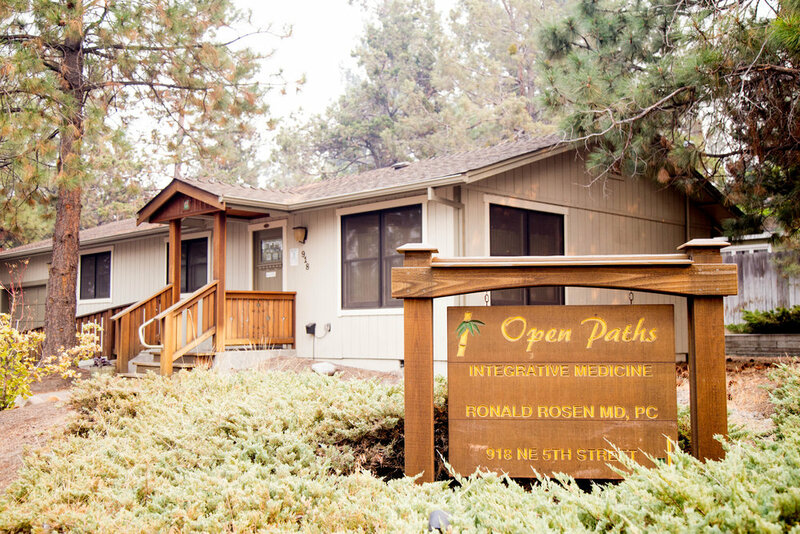 Read more about our practice and the systems and treatments we use at Open Paths.